Over 300 people showed up for the unveiling of the completed new ReUse Minnesota website on October 12. The website, that was three years in the making, was made possible thanks to a grant from the Minnesota Pollution Control Agency. The website launch party and membership celebration was held at Lake Monster Brewery, located at 550 Vandalia Street in St. Paul from 5-7 pm. The website (www.reusemn.org) serves as an online resource for both consumers and businesses interested in finding reuse outlets like secondhand stores, rental and repair services. ReUse Minnesota, Inc. was founded in 2012 as a nonprofit trade organization 501(c) 6 and has since transitioned into a statewide nonprofit organization 501(c)3, that promotes the process of extending the life of products, which is also known as reusing or up-cycling. The 501(C) 3 designation now allows them to raise funds as a tax-exempt organization. What is “ReUse,” you ask? Reuse means extending the life of products by using them until you are unable to do so. Then you either repair it, buy another one secondhand or sell it as is for someone else to extend the life of the product in another form. Donating is also an option, but whatever the choice or decision, all reuse options that many Minnesotans are making reduce waste. Rental, refurbishing, salvage, repairing and restoration are all part of the reuse economy. The event carried a warm and friendly atmosphere, possibly influenced by the complimentary first drink for everyone in attendance. There were other reuse vendors with tables set up ready to answer questions, and the music was provided by DJ Dan of Solar Bloom, a record curator at A Greener Read store. Other member sponsors included Better Futures Minnesota, Minnesota Computers for Schools, Vibrant Technologies and RSP Architects. There’s an old saying, “One man’s junk is another man’s treasure.” Minnesota’s reuse economy lives up to that saying in the amount of $10 billion a year in sales and employs 58,000 people, according to Todd Tanner, who is ReUse Minnesota’s board chair and is employed full time as the reuse coordinator for the University of Minnesota. The MSR spoke with Tanner during the event about the website launch and what it means for the reuse organization’s membership. MSR: How long have you been with Reuse Minnesota? TT: I have been president about one year now. MSR: How did the organization start and when? 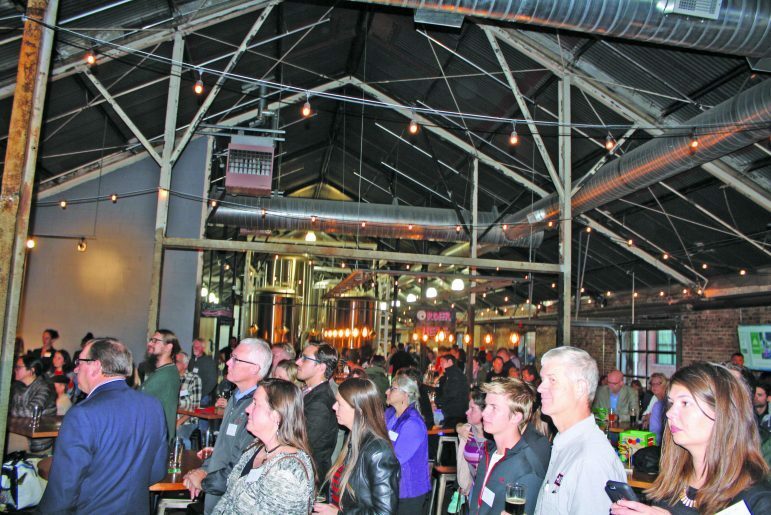 TT: About four years ago, but it started out being part of the Reuse Alliance and later transitioned into the current organization because we believed that we represented Minnesota better as a stand-alone nonprofit. MSR: How many members do you currently have? TT: We have 35 members. 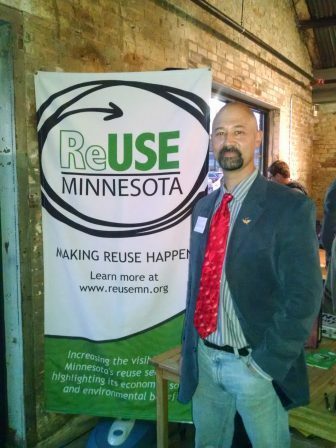 MSR: What is the benefit of being a member of Reuse Minnesota? TT: We bring together these different businesses and individuals to create business-to-business connections for these different organizations. Many of the members, because of the organization, have connected with other members and [are] able to transfer materials back and forth. For instance, I run the reuse program for the University of Minnesota. I have donated materials from our program for several members like Bridging [a nonprofit] received bedding [from us], and Arc Thrift Stores has picked up clothing from us. So these connections have allowed all of us to move material in support of the reuse economy. Tanner anticipates a huge response to the new website and hopes that more businesses and individuals sign up and become members. According to Tanner, it actually costs more to the environment to recycle and he says we should do everything we can do to reuse products for our environment and the economy. For more information about ReUse Minnesota, go to www.reusemn.org. James L. Stroud, Jr. welcomes readers’ responses to jlswriter@gmail.com.